Since the first time I met them, The Electrician’s family has welcomed me to all kinds of dinners and celebrations. I can’t tell you how much it means to me to be included in the big events and the teeny-weeny events, and to be treated like one of the group; it’s a totally new experience for me and I love it. Tonight, we got together to celebrate his grandmother’s birthday. She goes by Mamère, and she turned (good manners keep me from discussing) years old while The Electrician and I were in BC last week. Suffice it to say she is very young at heart, and I could show you a photo and tell you Mamère’s age, but that’s a pointless operation because you’d never believe me anyway. She’s a dish at 70 something; I hope I keep it together that long! While we were in Salmon Arm, our hosts took us to a local pottery and art sale to do a little shopping. My sweetie chose a beautiful hand-wrought glass dish streaked with vivid cobalt blue for Mamère. She loves blue and even just painted her living room a soft shade like the underside of a friendly cloud. 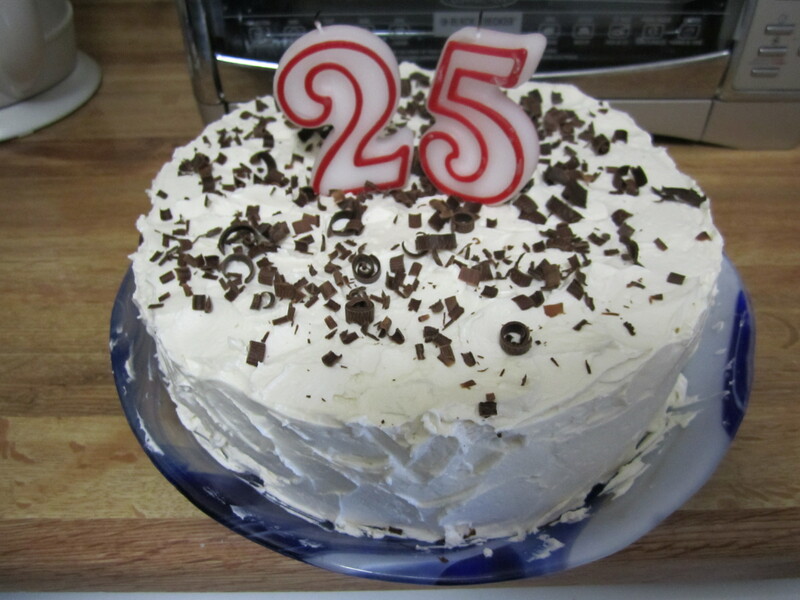 At some point, I volunteered to make the birthday cake for tonight’s little gathering, and The Electrician’s mom suggested that we serve it on the new glass plate, which curves up at the sides and could hold a cake or a hearty portion of stew. We decided to label it with the age she acts, not the age her driver's license declares. Mamère loves dark chocolate, which is one of the many reasons why we get along so very well. I built the cake in three layers, and filled between the layers with a dark chocolate sour cream ganache. Then I used more ganache as a crumb coat and let it set overnight in the fridge before (very) gently frosting it with a mildly sweet boiled milk icing. The cake is crooked because the plate isn’t square, but I did the best I could on the birthday dish that was built for esthetics; levelness was not a priority for the glassmaker, which is cool but makes layering a cake on it a pain in the ann-oos. See the little dark chocolate curls on top? Yeah, I started them and then went to do my makeup, and The Electrician finished the job. He’s very proud of what he learned to do with the veggie peeler today. 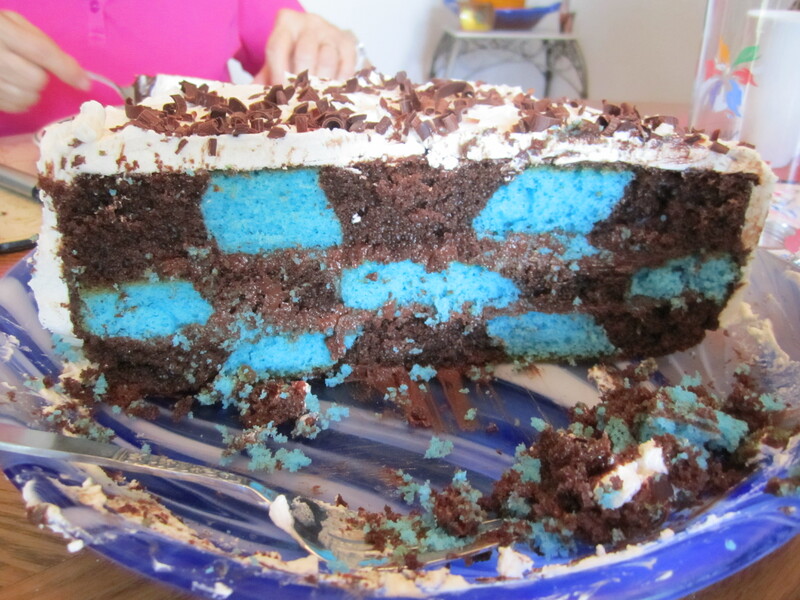 But the best part of that cake was what I did to the insides. Check it out. It goes with the plate! We didn’t tell anyone what flavour the cake was because we wanted the first slice to be a surprise. I used my checkerboard cake pan set, which I have been wanting to test out forever. Seriously, I’ve had it stashed in the cupboard for years. The lines between the devil’s food and the blue vanilla cake slumped a bit, but I think it’s because the cake was poorly supported on the curved dish. 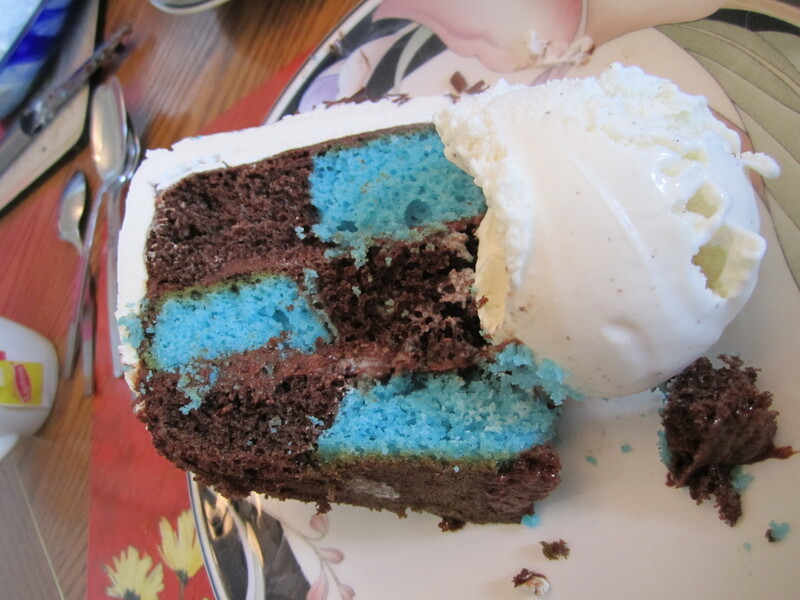 Regardless, the contrast of the chocolate and the Smurf blue is really pretty, and it tasted fantastic. I used sour cream to make the ganache, and it was delightfully zingy against the sweet cake. If you don’t have a checkerboard cake pan, check out the Wilton website. Wilton has no idea who I am, but they make some good products and I’m happy to recommend the stuff I like. So far, this blog is sponsored only by my dad and my day job, and sponsors aren’t exactly lined up outside the dollhouse. Anything I promote, I genuinely approve of because there’s definitely no profit involved. I found it much easier to put the cake batter into a big ziploc bag, cut one corner off and squeeze the goop into the pans evenly; frankly, I would have lost my mind doing it with a spoon. I’m going to practice at home a couple of times to see if using a level cake plate keeps the sections square after they’re layered, but I think a checkerboard cake will be coming with me to all the potlucks I attend in the next little while. Besides, no matter how you slice it, as long as the cake tastes delicious (and it did) people really don’t care if the dessert is just a little bit crooked. Anyone who does can make his own damn cake. That cake looks very fun and I LOVE that plate. haha: I went to the cake pan site and when you click on the cake pan link, the items on the side as ‘featured products’ are a 3-D skull or 6 coffin shapes pan. Um… I think I’d stick to the checkerboard theme. *In all fairness there is a 3rd suggested item: Petite Jack-o-lantern set (cute) so all is not macabre in desert land. * You wouldn’t care to share the recipe ……..would you? Actually, I used cake mixes for this one because I wanted to make sure the two different cake would be similar textures and weights so the cake would hold together. I like Betty Crocker mix if I need to go that way. I was also tight for time this weekend, but I might try for a homemade cake next time, since I know the pan works now. To make the ganache, I heated 1.5 cups of sour cream and 0.25 cups of skim milk almost to boiling, then poured it over 1.5 cups of chopped semi-sweet chocolate. The boiled milk icing is from Tasty Kitchen, which I don’t frequent these days, but it is by far The Electrician’s favorite. I think it exists as “The Best Icing I’ve Ever Tasted.” It’s really time consuming but not very sweet and quite light, considering how much butter is in it. A skull cake? It is NOT the right time of year for that yet! I draw little skull and crossbones on my students’ papers when they make a foolish error, so I’m not averse to skulls. Wilton has lots of great stuff, if you watch carefully for the deals. Cake mix sounds right up my alley. I’m not much of a cake fan. In fact, in my little family, we have birthday brownies instead, BUT this looks like so much fun I may give it a whirl , or check, from time to time. I remember, as a girl, thinking that when I grew up I could eat a whole thing of icing if I wanted to. Then I grew up and too much icing is very unappealing: never thought something could sweet me out. SO the not too sweet icing sounds intriguing. Oh, by the by….. On that Wilton site there was also the ’tilt’ cake stand. It is meant to make it easier to fancy up the sides of your cake, but I thought of Rechelle’s slanted cake and thought it could also be handy to make uneven cakes look level. Well, it was funny at the time. Hmm. I might need to look into the slanty turn table. Sometimes I make fancy pants cakes for weddings and stuff like that, and being able to tilt the things might help my wrists and speed up the process. Thanks for the hint!